Here’s a transformer-robot movie starring an 11 year old boy, Dakota Goyo, that has violence, offensive language, fighting to the death, drunk rip-roaring riotous crowds and an ad campaign that’s aimed for families. If your children are 13 or above then fine, but that’s not the age group I sat with at the local theater. Many ranged in age between 3 and 10 years old. 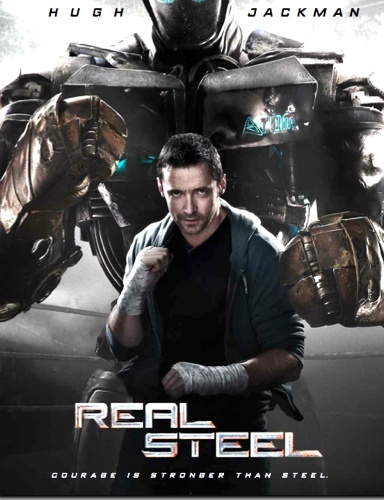 As a former teacher of elementary school age children, I do know a thing or two about what’s appropriate for this age group and “Real Steel” is not. Hugh Jackman plays former boxer Charlie Keaton in 2020 where robots (bots) have replaced humans in the ring, controlled by a circuit board. To make a living, Charlie pieces together used bots and spares them in underground fights. Bot fighting isn’t working so well for him as he’s in debt, which leads to an occasional beating by his creditors. When his son shows up, many things start to change including his luck and the softening of his heart. The film’s script has a “Rocky” feel with an underdog bot named Atom as the hero. Goyo as Max Keaton (Charlie’s son) has the same determination as his dad. He becomes immersed in the seedy adult underground world full of bot matches as his bot Atom has an edge due to his coach, (Charlie) who’s a former boxer. The bot fighting world comprises drunks, shady deal makers and people that enjoy viewing violence as a recreational sport. Most of the fight scenes are filled with ear piercing, screaming, shouting, grand standing and frenzied liquored up crowds. You’ll hear the robot boxing announcer saying, “Here’s Noisy Boy, a cold blooded killer who will fight to the death.” During one match a bot is chastised and the dialogue is, “Get back in that corner bit*?h and take it like a man.” Or − “He’s ready for some de-cappuccino, (as in decapitate).” Next, we see the bots head knocked off and a pool of oil surrounding his headless body. I call ’em, like I see ’em, and this one’s way too violent for children. In the opening scene we view Charlie Keaton driving towards a carnival-rodeo where his bot will fight a bull. The fight scene is pretty violent as the bot is torn apart by the bull, leaving Charlie with a large debt and fleeing as fast as possible. Upon discovery of his son, Max, Charlie tries to cash in, as Max’s wealthy aunt’s husband offers a hefty payout for custody. A deal is made and Max has the summer to bond with dad with the promise he’ll be returned to his aunt in two months time. Atom the bot begins to win matches and Max is hooked. Dad thinks it’s okay as well, because Max is fairly savvy in the business end of fighting and begins to bring in some real cash. Life is looking good until Charlie’s past comes back to haunt him and another violent scene is presented along with a baseball bat as a weapon. The ending is predictable and played out with all the drama that’s typical throughout the film. I’d say director Shawn Levy missed the mark on the target audience for this one. If Max had been cast as an age appropriate teen then the film would have had a completely different tone. I might have given it another half star, but all in all, the entertainment value of the film was not there. Imagine staring at those red and blue Rock ’em − Sock ‘em robots that were popular in the 80s as a spectator, that’s what the movie feels like−boring.